Postcards From The Smokies » Are You a Picker? Join These Twice-Monthly Jam Sessions. Are You a Picker? Join These Twice-Monthly Jam Sessions. Twice a month, there’s an informal gathering of string musicians at Bryson City’s Marianna Black Library for the Community Music Jam. The group generally includes a mixture of professionals, amateurs and learners; and in the Summer — when they usually gather outside under the shade tree — there can be as many visitors as locals. Anyone with a banjo, guitar, mandolin, fiddle (anything unplugged) is welcome. Larry Barnett of Grandpa’s Music keeps the music flowing and the fun going. Normally, Larry calls out a tune and its signature and the group plays it together. But there’s also an opportunity for anyone to perform a favorite tune for the group. 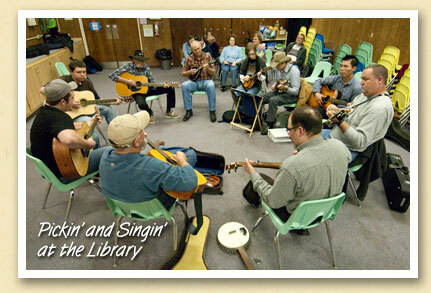 The jam sessions offer a chance for musicians of all ages and levels of ability to share music they have learned over the years or learn the old-time mountain songs. Community Music Jams are held on the first and third Thursdays of every month, from 6:00 to 7:30 pm at the Marianna Black Library. For more information, call 828-488-3030 or visit the library web site.